Left to Right: Front Row: Bruce Thoene, Wise Master; Larry Johnsen, Master of Kadosh; Rob Litwiller, Commander of Kadosh; Monte Harris, Venerable Master. 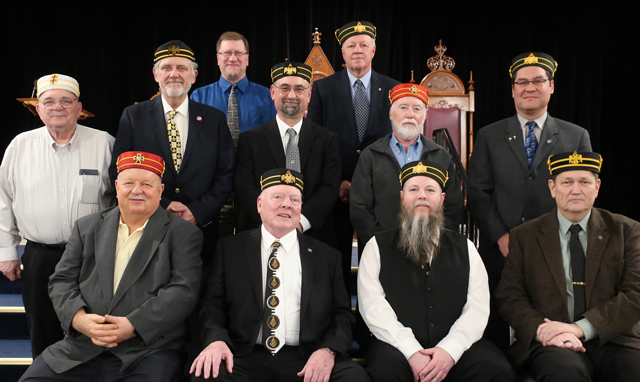 Seond Row: Russ Risley, Assistant Almoner; Joe Laleman’ Secretary/Registrar; Mike Jones, Treasurer, Robert Francois, Almoner; Aaron Sharp, 1st Lt. Commander;. Third Row: Pier Trevisan, Sr. Warden-Rose Croix; Mike Botts, Prior. Not pictured: Phil Corwin, Sr. Warden-Perfection.